MSAFE are a health and safety consultancy firm offering health and safety services to businesses across Hampshire, Dorset, Devon, Cornwall, West Sussex and Wiltshire. MSAFE’s health and safety consultants in Bournemouth, Bristol, Cardiff, Swansea, Cheltenham & Oxford support your business needs by providing health and safety advice to help you comply with the latest regulations. MSAFE’s health and safety advisors work closely with your organisation to help improve your health and safety management systems, their experienced safety consultants are practical and highly qualified. The services of workplace health and safety consultants, MSAFE, can be tailored to meet your company’s requirements. They can assist in engaging the workforce with the processes, advising on risk assessments & policies and ensuring your systems are effective when you appoint MSAFE as your health and safety consultant. With MSAFE acting as your health and safety advisor you can be reassured that you have the guidance you need to comply with your legal duties. H&S consultants, MSAFE, can provide telephone or email advice, site inspections, accident investigations and liaison with insurance companies. 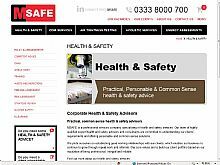 If you are looking for health and safety companies in the UK contact MSAFE to arrange an appointment with one of their independent health and safety consultants. MSAFE offer a wide selection of health and safety training courses including manual handling, fire warden training and asbestos awareness courses. MSAFE support small to medium businesses with health and safety training throughout the UK having established a strong presence in the Souths key business centres including helping firms in London, Bristol, Basingstoke, Southampton, Portsmouth and Winchester with their health & safety training needs. For health and safety services or competitively priced health and safety courses in the UK contact MSAFE today.